Just minutes from Downtown Vancouver, the Granville Island area is one of the city's signature attractions, spilling over with restaurants, theatres, galleries and studios. Once an industrial area, Granville Island now features numerous local artists and artisans working in studios that formerly housed foundries and machine shops, performers who have taken over empty warehouses, and a world reknown market featuring local produce and fare. Our goal is to provide the same level of access to everyone. We faced a few challenges regarding the wheelchair accessibility of the venue due to the age of the building. We will still try our best to provide a solution for those of you requiring assistance. Please reach out to us if you have any special requirements or concerns about accessibility. Email us at accessibility@pycascades.com so we can help make this a great conference for you, too. Email to this address will only be visible to the organizers and will be kept confidential. If you prefer a different way of communication, please let us know. Vancouver offers many options for accommodation at any price level within less than 15 minutes of the venue. You can either choose to stay in the downtown area and take the AquaBus across the bay. Or choose a more boutique experience on Granville Island. The three hotels below are just a selection based on their proximity to the venue. You can find many more options on your favourite booking sites. AirBNB is also available in Vancouver, in case that's more your thing. 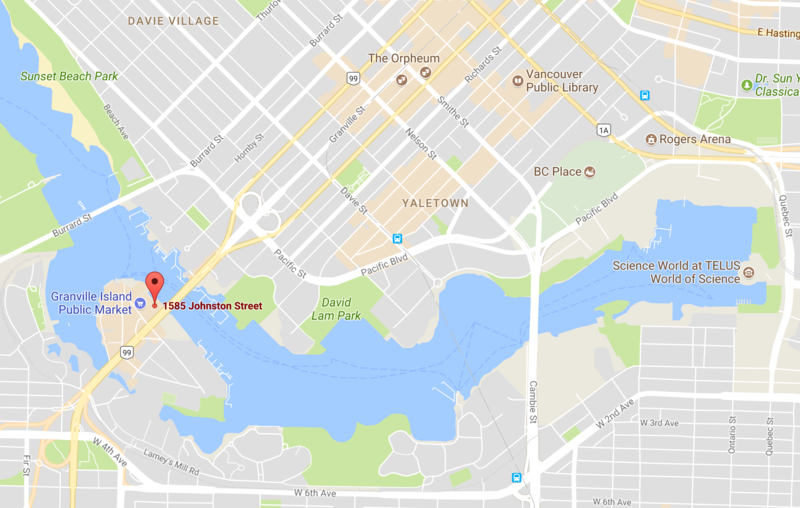 Simple lodging with free Wi-Fi, located on the same side of the bay as Granville Island. The venue is about 15 minutes walk away. Located in Downtown on buzzling Granville Street, this hotel is close to some nice pubs and bars. A short walk from the AquaBus to Granville Island make the conference easily accessible. At a higher price point, this boutique hotel has amazing views from Granville Island onto False Creek. It's a 2-minute walk away from the venue. Granville Island is considered one of the best places in Vancouver for a large variety of artisanal and fresh foods. And we don't want you to miss any of that. That's why we have decided to leave the choices for lunch up to you. This will give you an opportunity to explore the island a bit more and choose the culinary experience that makes you the most excited. The Granville Island Public Market right next door is just one of the many options available and provides a large food court. The vendors cater for all preferences from meat lovers to vegetarians and vegans, from food truck style to delicatessen offerings (writing this is already mouthwatering 😉). Take a first peak at some of the food options on the Public Market website or explore other food options on the Granville Island info website. And make sure you bring an appetite on the days of the conference. You won't regret it. Vancouver has a great transit system operated by TransLink. It consists of buses and train but Granville Island is best reached by busses. From Downtown, line 50 has the closest stop to the venue but 4, 7, 10, 14 and 17 all get you within a few minutes walk. Check out the transit map. TransLink has removed paper tickets and requires everyone to have a reloadable "Compass Card" so you can touch on and off when us use the bus or train. Cards can be purchased at Vending Machines and various retail locations. For those of you staying in Downtown close to the Granville Bridge, you can also take the scenic and quirky "AquaBus" across False Creek from either Hornby Street or David Lam Park. It costs between $3.50 and $5.50 and take you right to the dock at the venue. Our city is one of the few in North America that doesn't allow Uber, Lyft or others. Instead, you'll have to rely on the local Taxi companies such as Black Top and Yellow Cab. The latter has an app that allows you to book a cab...but the experience falls very short of Uber or Lyft. So be prepared for some old school cab experiences. Like in many other cities, Vancouver isn't much different when it comes to dealing with parking. You'll have a hard time finding public parking close to the venue. Your best option will be the Granville Island EasyPark Lot with a maximum charge of $15 for 24-hours. Should you decide to accept the challenge of finding street parking, you might find a spot in the nearby residential areas but more likely you'll end up having to take a metered spot. In that case, you should get youself the app PayByPhone. It allows you to pay for any parking meter with your phone and even extend your parking when the time is up. Enter your email address below to stay up to date with event announcements.